This hotel is by far one of the largest in Gilroy and since their remodel in mid-2007, each guestroom is larger and has been spruced up with lovely dark wood furnishings and contemporary bedding making guests feel at home and relaxed. Free hot breakfast is available in the lobby every morning and guests are welcome to dine in the privacy of their rooms if they prefer. The property has tennis courts and a large swimming pool where guest can get some exercise and relax in the warm Gilroy sun. 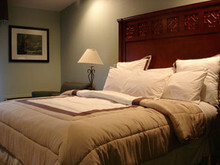 Whether traveling for business or pleasure, Forest Park Inn Gilroy California is the most comfortable lodging choice. With so many wonderful things to do and see in Gilroy, families and couples can create a complete itinerary of excitement and adventure. From their family theme park Gilroy Gardens and hiking throughout Mt. Madonna to wine tasting at local wineries on the Hecker Pass Wine Trail and antique shopping in downtown, visitors never want to leave Gilroy. The Forest Park Inn is truly one of Gilroyï¿½s top lodging options.